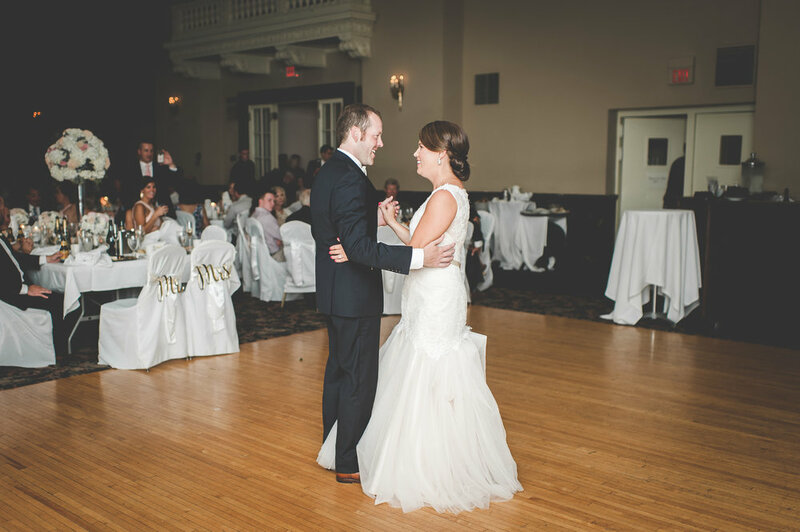 This week we're highlighting Laura & Ben's wedding that took place on July 22, 2017 at the St. Paul Athletic Club in St. Paul, Minnesota. Laura came to us in late 2016 as she realized who would be the point person the day of her wedding to help oversee setup, teardown and everything in between!? Who would help with a wedding day timeline? Who would be there the day of the wedding to ensure everything was running smoothly and on time!? That's when she found us! Laura and I met for coffee on a chilly winter weekend morning at Caribou Coffee. She briefly mentioned where she was in the planning process and what exactly she was looking for day-of. In short, she was looking for someone to "pass the baton" so she could focus on just one thing on her wedding day -- being the bride, of course! A few short days later, she decided to hire us and we were thrilled to get the chance to work with her and Ben! The rest of winter and spring flew by and we soon found ourselves in the midst of summer. Laura and I met one last time to go over the final details and timeline in early July. A few short weeks I attended the rehearsal and helped coordinate those logistics to ensure everyone was prepared and ready for the big day! The next few days flew by and we found ourselves waking up on July 22nd, 2017 -- Laura & Ben's wedding day! Tina and I showed up to start setting up the final details of the ceremony and cocktail hour space. The reception was already setup by some of Laura's friends and looked BEAUTIFUL! Once the ceremony began, I verbally walked everyone through that one last time and then it was go time. Tina cued the pianist and I assisted in getting the wedding party down the aisle one-by-one.... flawlessly. Once the ceremony ended, guests went upstairs and enjoyed a drink and cotton candy in the Butler's Bar. After that, guests went one more level up to where the reception was held in the beautiful ballroom. The night continued with nothing but smiles, laughter and good times. Laura & Ben -- CONGRATULATIONS! Wishing you many years of love, laughter & happiness. Events by Melody Named Winner in The Knot Best of Weddings 2018!